I had the privilege of spending the weekend with Centennial House this week. It was life-giving experience for both my wife and I. Since I live in Denver, I am fortunate enough to be able to spend a lot of time with St Columba House. I got to orient them to Denver when they arrived, and I spend every Friday with them for their Formation time. Since Steamboat Springs is a three-hour drive away, I don’t have that same experience with the fine women of Centennial House. Being able to come up, stay with them, and spend their Formation time together was a rare treat. It made me wish I got to do it more often, and as we drove away I noticed some sadness. I felt a sense of loss- I was leaving half my community behind. Harlowe, Brittany, Georgi, my wife and me (I’m the one in the back with the blurry face and really short hair). In our conversations this weekend, we talked about what being in a community as the Colorado Episcopal Service Corps really means. Our Corps members come to live in community with one another, but we are also building a community across the whole program. This can be tough. Though being in community is immensely rewarding, it is also challenging. How do we live in community, when we don’t see each other every day, and our experiences are so different? For us, our community is anchored in our shared goals and values: transforming individuals and growing courageous communities through prayer and action. We have come together in order to be a community together, and this intention grounds us. We can work through conflict, difference, and distance because we are grounded in this way. We are a community. In my last blog, I attempted to write a very clever story about how I happened to live in Denver. I hope that story revealed how my living in Denver had mostly to do with prayer. For more than a couple of years I prayed that God would do a mighty thing in my life. Boy has he. Despite some minor bumps in the beginning and a few household issues, there is so much going on that is terrific. Check back with my writing in 2 months and you may notice that I am not as excited. But, this blog is being written on a day with which I am very pleased. I have delicious coffee in my favorite mug I brought from home, the Great British Baking Show playing in my ear and I’m wearing an amazing crewneck. This great atmosphere causes me to share with you what I am most excited about at the almost-two-month mark. To be clear, I have worked at a number of unsatisfying locations. I have worked for bosses who don’t appreciate my initiative and bosses who don’t know how to direct my energy. I’ve worked for bosses who didn’t pay me and bosses who couldn’t remember my name. None of those unfortunate qualities describe my current work site. It’s incredibly refreshing to work for an organization that encourages thoughtful work and maintains a healthy set of workplace boundaries. I have now been with Work Options for Women for 6 weeks and I simply cannot believe how full I am at work each day. I’m not completely sold out, there are still tough moments and times I get bored. Rather than finding the flaws to be larger than they really are, I’m focusing on the enjoyment of all the small things. Each day I show up and am busy -all day. One of my parents once said that in order to sleep well at night I have to tire out my brain. He/She most likely said this because I have a wondering brain and a proclivity for staying up late. However, because I am busy all day at WOW, I come home exhausted, my brain is completely worn out. Dealing with both paperwork and people allows my left and right sides to exercise. I’m referring to my brain of course, not my obliques. Going to bed tired is just half of the equation. I also wake up knowing that everything I will do at work in the upcoming day will be worthwhile. Both the sleeping and the day-long purpose make this an experience I am deeply enjoying. I was voted “Most Likely to be President” (female category, of course) by my senior class in high school. Counter to that particular selection I have not been sold on working since I graduated from college. I would really love to stay home, much to my family’s chagrin, and raise some weird little children ducklings. Why would a formerly future president choose not to work? It just hasn’t seemed worthwhile to get out into the working world if no one is really happy. What I have personally experienced and heard from past co-workers, is that working is often a huge drag. I constantly wonder, does everyone just go to work miserable? Has everyone decided that making money is better than being satisfied for 40+ hours a week? Three summers ago, I had the privilege of working for another group of people whom I trust like the I trust the women at WOW. It’s important to note that I still work for these people whenever possible. So, now that I have had two positive work experiences, I guess I can’t ignore that there are opportunities that allow me to be satisfied and happy with a place to work. There is a chance for us to choose better for ourselves. IF WE WAIT. I can’t feel more sure about that small little fact. It takes time, something we never feel we have enough of. But, if we are willing, we can find the workplace that is satisfying and happy. It may not always be amazing, there will of course be warts, but at some point we have to decide not to be miserable. It took prayer and a whole lot of confusion to finally find a place where I am very full. I may not fulfill my senior class prophecy, but I hope to do better than find work to be a drag. That feels like a very mighty thing. 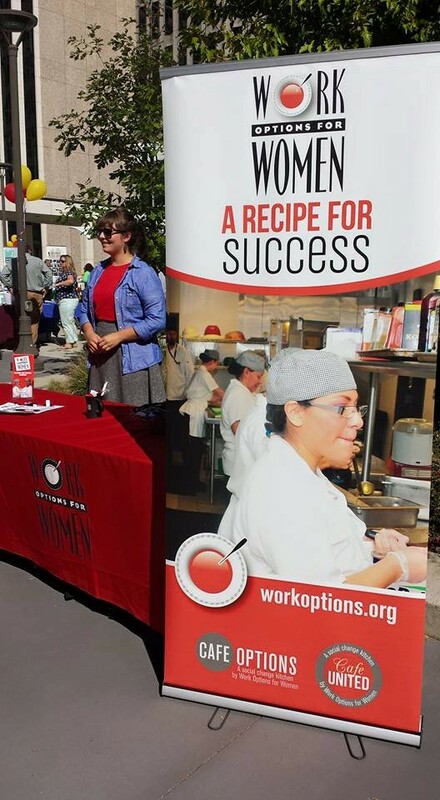 Representing WOW at a Combined Federal Campaign event in Downtown Denver. With Amy, fellow WOW Program Assistant, at our 2015 Fall Graduation Ceremony. It is hard to make a decision! Once a choice is made, the good things that would have come from making a different choice vanish – so feelings of sadness often accompany the good feelings that led to the decision. This year as a Colorado Episcopal Service Corps member, I have been spending two days a week working at a shelter for homeless youth, and another two days a week working at a housing complex for youth who were recently homeless – both locations are part of an organization called Urban Peak. In both locations, I have felt challenged and occasionally overwhelmed – I’ve never worked with late teens/early twenty-somethings before. One afternoon a couple weeks back, I was waiting at the bus stop after finishing a shift at shelter. Suddenly a feeling came over me – a feeling of wanting to be at the shelter more often. This was an odd feeling, since I had found being at the shelter so challenging, but I couldn’t shake it. I realized that being with the youth and co-workers there was creating an emerging joy within me, and I realized I wanted to be there more than just two days a week, to get to know them and the place better. So I asked my two supervisors (one at the shelter, the other at housing) if I could shift to being at the shelter four days a week, instead of splitting my time between the shelter and housing. They said yes! End of story right? Everything is joyful butterflies from now on right? Well no! It was hard to end my time at housing! It was hard to tell my co-workers at housing that I was leaving, after spending some time getting to know them. I feel guilty about leaving them with a little less help. And it is sad when I think of what I might be missing at housing. So it is hard to make a decision. Once the decision is made, I am not rewarded by feeling like the decision was right 100% of the time. I have begun to notice, though, that I feel a certain freedom in trusting that God is leading me and those around me to somewhere good. I am excited to see what that journey is like, even if the decisions that accompany that journey are difficult. Moving to Colorado in order to give a year of service to the Episcopal Service Corps has proved, thus far, to be one of the best decisions that I’ve made in my life. However, like many things in my short experience of being a young adult, I found the process to be exciting yet also causing me an intense amount of worry about what this new chapter of my life would lead to. I’ve found this to be a common occurrence in my life when it comes to making important decisions and dedications, as I’m sure it has to anyone my age as well as those much older than me. While I’ve found comfort in the fact that I’m not alone when it comes to this, I still find myself in moments of great distress when it comes to making a decision that will undoubtedly change my life in some way. Don’t get me wrong, I feel much more confident in the twenty-four-year-old Andrew than I did in the eighteen-year-old Andrew or any year before or after this point in my life. With age has come more wisdom, passion for my interests, and empathy for others along with a lot of other things unmentioned. Wisdom, for me, has been a double edged sword of sorts in the fact that it has provided me with the confidence of making a decision because of my greater faith in things working out how they are supposed to in the end; however, it also has given me the tools necessary to examine the situation and all possible outcomes, giving way to my worrying about something I’ve decided to put my all into. Being unsure of your decisions or where you’ll end up in life is, again, not at all uncommon for someone my age. Many people try multiple occupations, experiment with different ideologies, and go through a multitude of relationships with others before discovering exactly who it is that they are. I am currently in the ongoing, seemingly never ending, process of self-discovery while being involved in organizations where I find myself having to give assistance to others. This has proven to be a difficult task at times, considering the fact that I often have to show the part of me that is completely confident while pushing the part that is unsure into the background. This is especially true when working with the 32nd Avenue Jubilee’s after-school program where I do my best to assist the kids there with school work and engage with them while at times pretending that I don’t remember what it was like to be in grade school. This attitude can also be beneficial at St. Clare’s ministry, where I assist with a church service and dinner that hosts mostly homeless individuals. I find myself talking to those in attendance about faith in things getting better and the importance of keeping a positive attitude while I am questioning my own place in life and wondering when I will figure out what it is I should be doing in this world. I don’t think that my being unsure of what my calling is in life is necessarily a bad thing at this point in time, as I am constantly told by others that I’m still young and will figure this whole thing out eventually. I also see this year, among many things, as a chance for self-discovery and developing and utilizing skills already identified. I am very grateful and feel very fortunate to have this type of opportunity that many don’t get the chance to try. Still, I can’t help but feel the overwhelming irony in my personal and spiritual journey; it seems that many people my age are completely certain of which direction they are headed while I still search for a sign of a position that would fit me. While the eighteen-year-old Andrew would probably find a reason to wallow in this fact or arrogantly shove it to the back burner, I’ve discovered that the best response I can have to being unsure is to dive into a new situation head first. I realize now more than ever that I will make a ton of mistakes throughout my entire life and that it is the only way to get better at something you’re truly dedicated to doing. I no longer sit idly by and wonder why God hasn’t thrown an answer in my face, but actively engage in all of the blessings and opportunities that God has given me in order to figure out where my skills are needed in this life. I may struggle with finding my niche for some time or I may discover what I should be doing tomorrow, but I know that with my faith in letting God show me the way I will discover what I’m searching for in due time. I’ve wanted to live in Colorado for a while and in a mountain town with a ski hill even longer, but if you had told me last year I’d be living in Steamboat in 2015, I would have laughed. 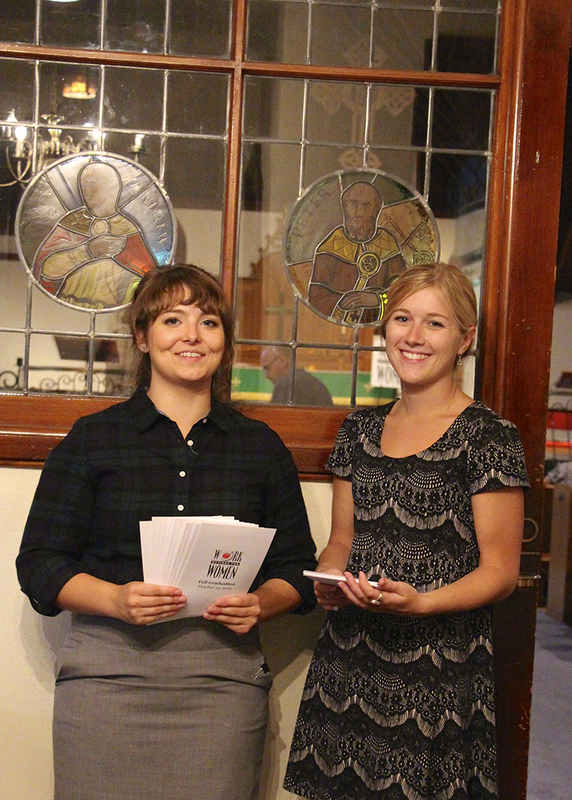 When going through the application and placement process with the nation-wide Episcopal Service Corps, I planned on going to grad school to start a higher degree in American Religion in 2016. I wanted to spend this year somewhere in the US where the religious landscape was very different than California (where I went to high school and college), and also try to get some culture shock, since I was feeling a little complacent in my west coast comfort zone. I had applied to Colorado because the state and its mountains appealed to me, but I planned to go to Fayetteville, Arkansas. To quote Catie, our Centennial House director, I made a plan and God laughed. Honestly, I was scared living in CO for a year would be “too fun”, but when the program in Fayetteville did not run this year, I took that as a sign and started packing my ski gear. This isn’t the first time I made a plan and God laughed. During college I had a somewhat distressing discernment process in which I decided to depart from my teenage dream of working for the UN. After high school, I intended to study some kind of physical science and some kind of social science that would be at least a little compatible with my goal of working in international relations. In 2011, the summer after I graduated, I was fortunate to be able to travel to Jerusalem with my Israeli friend. One day, while standing on a roof in the old city, I looked out over the intermixed religious symbols or crosses, stars, and moons, and made an inspired decision to study religion. I planned to incorporate this into my international relations dream, thinking to work against religious violence. In college, God’s laughing took the form of some fantastic classes and inspirational professors. While studying religion at UCSB, I was sidetracked by a few classes, including “Religion in America Today” and “New Religious Movements”, fell in love with the study of contemporary American religion, and made the hard decision to pursue an academic career in Religious Studies. That brought here, me to my year with ESC. I think God may be laughing again. After living in Steamboat for almost two months, I am dreading the day when I have to leave. I knew I would enjoy living in the mountains, but I didn’t realize how much my living location could add to my life. This afternoon, the other Centennial House members and I hiked to the summit of Hahn’s Peak, a 10,800 ft mountain less than an hour north of our house. I’ve always loved the wilderness, but I think I am slowly discovering how important getting out there is to my spirit. We have an ongoing project within the Colorado ESC to take photos of “how God sees the world”, and I’ve that all the photos I take are on hikes. In California, I used to stare at or swim in the ocean to feel close to God. The power of the waves and the tide made me feel at once connected to creation and in awe of its creator. Here, it seems looking out over the vast mountains of Colorado functions in a similar way. I had a plan for which grad schools I was applying to and what I wanted to study, but I’m pretty sure God is looking at that plan and cracking up. Through laughter, I think he’s telling me to pay more attention to myself in each moment rather than try to make and stick to such specific long-term plans. I guess he knows far better than I do where I’ll be years down the road. Hopefully, by the end of the year God and I will have figured out a plan that works for both of us, so I’ll keep you updated on that. P.S. – Everyone should try to make the peach shortbread Georgi posted the recipe for, they were delicious! Bonus photo. 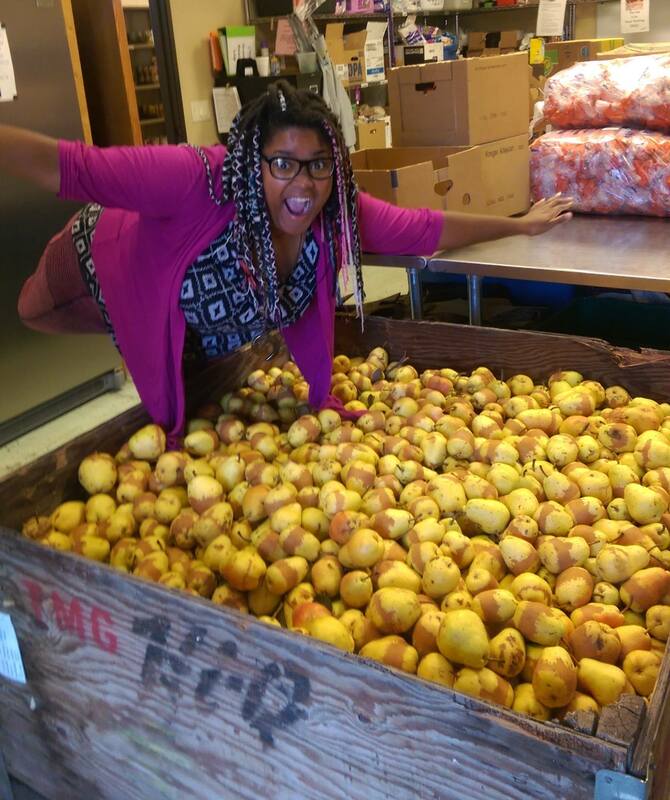 I am preparing to dive into a giant crate of pears. No pears were harmed in the taking of this picture. 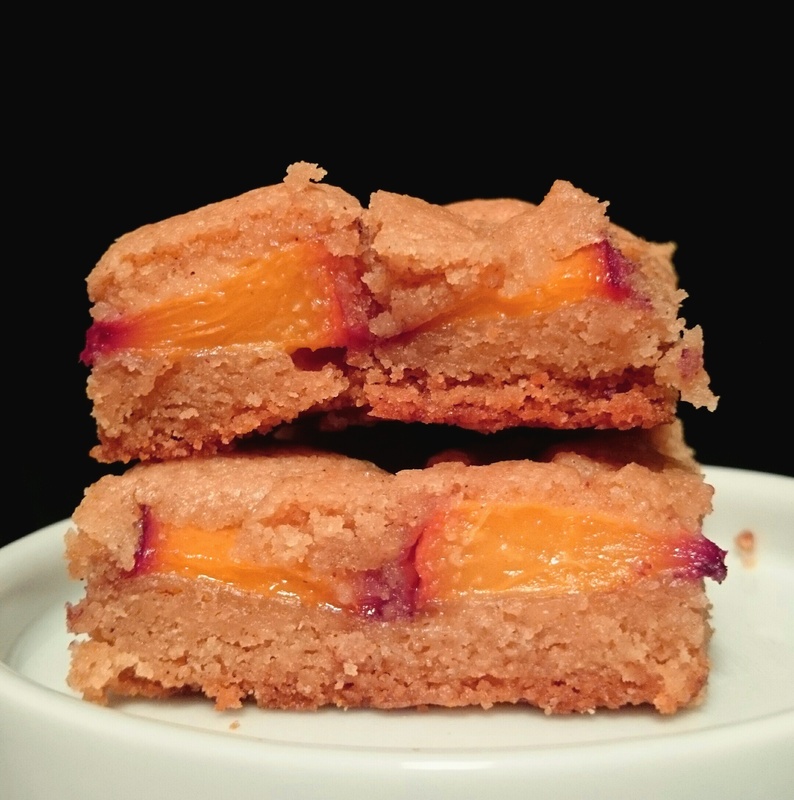 Easy and delicious peach shortbread. Preheat the oven to 375°F (190°C). Butter a 9×13 inch pan, or spray it with a nonstick spray. In a medium bowl, stir together sugar, baking powder, flour, salt and spices with a whisk. Use a pastry blender, fork or your fingertips, blend the solidified brown butter and egg into the flour mixture. It will be crumbly. (At altitude you may need to add a bit more flour. Add about a tablespoon at a time until it begins to crumble.) Pat 3/4 of the crumbs into the bottom of the prepared pan, pressing firmly. Tile peach slices over crumb base in a single layer. Scatter remaining crumbs evenly over peaches and bake in preheated oven for 30 minutes, until top is slightly brown and you can see a little color around the edges. (If after 30 minutes it needs more time, reduce heat to 350 and leave it in for 5-10 more minutes. Tent edges if browning too quickly.) Cool completely in pan before cutting into squares.